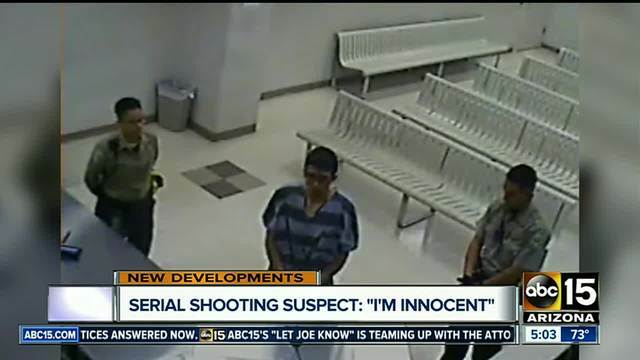 Accused Serial Street Shooter Aaron Saucedo: "I'm innocent"
For more than a year, Phoenix police were stumped by a string of killings in which a shooter stalked victims after dark and gunned them down as they stood outside their homes or sat in their cars. In all, nine people were killed in the case dubbed the Serial Street Shooter. Police fielded thousands of tips, went door-to-door in a largely Hispanic neighborhood of Phoenix where the shootings happened and analyzed ballistics from a different, unrelated serial shooting case. On Monday, they announced they had arrested a former city bus driver in the killings while providing scant detail about what motivated him or details about how they made a break in the case, other than to credit tips. Aaron Juan Saucedo, 23, faces 26 felony counts of homicide, aggravated assault and drive-by shooting for 12 shootings that took place between August 2015 and July 2016, Phoenix Police Chief Jeri Williams said. ABC15 has learned there is a possibility of more arrests in this case, but that may or may not happen. Saucedo made an initial court appearance late Monday night. In his appearance he told a judge, "I'm innocent." A judge temporarily granted a prosecution request to seal records related to the appearance, court spokeswoman Karen Arra said. Deputy County Attorney Patricia Stevens filed a motion to seal the paperwork, which was granted. Stevens is the same individual who requested the paperwork be sealed for Mark Goudeau, dubbed the "Baseline Killer" who was convicted in 2010 of nine counts of first-degree murder and dozens of other felony charges stemming from attacks committed in 2005-2006. Arra and Amanda Jacinto, a spokeswoman for the Maricopa County Attorney's Office, said no information was immediately available on why prosecutors requested the records be sealed. The investigation into the serial killings had focused on what authorities said were seven fatal shootings. But police on Monday said they had tied Saucedo to nine killings in all -- eight random victims and one man that he knew. Saucedo was a bus driver for the city of Phoenix through a temp agency for several months in July through August 2015, Phoenix police said. Records show Saucedo was pulled over for allegedly running a red light on Oct. 27, 2015, just a month after the first killing. On Monday, Williams and Mayor Greg Stanton appeared alongside other top officials, including Maricopa County's top prosecutor, to announce the break in a case that had appeared largely stalled in recent months as leads and tips dried up. "This case plagued our community for more than a year ... and left behind a trail of victims that included mothers, sons, brothers, sisters and families still mourning the loss of their loved ones," Williams said. Police say they don't know what motivated Saucedo and that he didn't have any connection to any of the eight people who were killed. They said they'd be giving out the $75,000 reward offered for tips, but they wouldn't reveal details about whether the money was going to one person or multiple people. The case finally broke when Saucedo was arrested last month in connection with the August 2015 fatal shooting of 61-year-old Raul Romero, who had a relationship with Saucedo's mother. 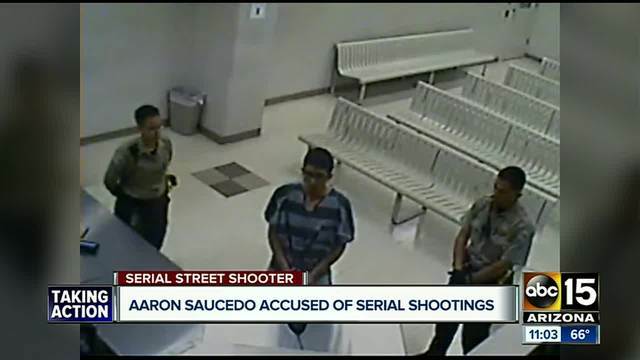 Authorities investigated Saucedo more closely and connected him to the serial killings. Saucedo has pleaded not guilty in that killing. The Associated Press was unable to reach Saucedo's public defender on Monday. Police say that after Romero's killing, Saucedo struck again about four months later in killing 22-year-old Jesse Olivas, who was gunned down on New Year's Day 2016 while standing in front of a home. In the end, nine people were killed in 12 separate shootings. All of the killings were random except for the first one, Williams said. "We hope that our community will rest a little easier and that our officers will get a little more sleep knowing that the wheels of justice are finally in motion," she said. Gisela Castro, the mother of shooting victim Manuel Castro-Garcia, said news of the arrest felt like she was reliving the day she was told her son had been killed. Castro-Garcia, 19, was fatally shot on June 10, 2016. "For one part I'm happy because there's going to be justice in my son's death and others' deaths and that person is not gonna do more damage. But my son is not coming back," Castro said. "I waited every day for justice, but things don't change. The pain is the same." "The only thing I can say is thank God there's going to be justice and we leave it in God's hands. May God bless (Saucedo), and I'm not anybody to wish bad upon him," she said. Marina Smith, the partner of 21-year-old Diego Verdugo-Sanchez, who was gunned down on April 1, 2016, said she welcomed news of the arrest but was still struggling with his loss. Smith was seven months pregnant with the couple's child when Verdugo-Sanchez was fatally shot in front of a home. Smith said she had grown frustrated over the past year as detectives kept her in the dark about the investigation. "The fact of them finding somebody, at least it was some type of news," she said. Police say Saucedo shot at two teenage boys on March 17, 2016, striking one of them in the arm. The suspect struck again the next day but didn't kill anyone. The next shooting didn't happen until April 1, 2016, when Verdugo-Sanchez was fatally shot. Police also have linked Saucedo to the April 19, 2016, death of 60-year-old Krystal White; the June 3, 2016, death of Horacio de Jesus Pena; and to the killings of two women, Angela Linner and Stefanie Ellis, and 12-year-old girl Maleah Ellis on June 12, 2016. He killed Manny Castro Garcia on June 10, 2016, police said. In the most recent attack on July 11, 2016, a 21-year-old man and his 4-year-old nephew escaped injury after the gunman shot at a vehicle they were sitting in.